Luckily, the weather held for us, and these folks tallied 762 observations of 362 different species, representing some interesting biodiversity for Glencarlyn Park where all the activities took place. While some observations still need to be added and some identifications still need to be confirmed, we do have some initial numbers. The Arlington BioBlitz herpetology team with a Northern Ring-necked Snake. An early morning bird watching team saw 26 bird species, including some migrating warblers such as both Tennessee and Chestnut-Sided Warblers. Botany teams recorded 166 different plant species. While only two amphibians and 4 reptiles were seen, one was of a Ring-necked Snake under a snake board placed out there as habitat and to make surveys for wildlife easier. This snake is fairly uncommon in Arlington and had not been recorded in Glencarlyn before, so was a very good find. Seventy-six insects species along with a dozen arachnids were also noted. 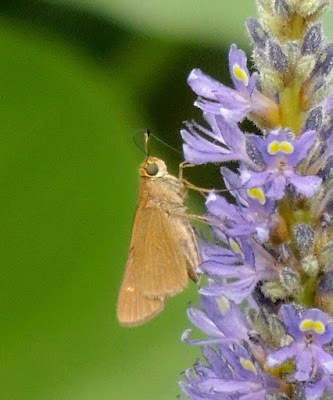 These included two unusual butterflies for Arlington, the Fiery and the Ocola Skippers, which only are seen late in the season when they move through as they cannot survive our winters. The Ocola was a first for our Arlington County records. Another insect, the Mile-a-Minute Weevil, is a recently introduced beetle that was released in an effort to manage numbers of the terribly invasive Mile-a-Minute Vine. It wasn't even an option to pick from in the iNaturalist application used to record and crowd source identifications, though after we pointed this out, it has since been added. Several years ago, Fairfax County had gotten approval for its release as a test biological control. When some showed up in Arlington, we purposely did not treat the Mile-a-Minute Vine where it was seen to let it get established. That seems to have worked quite well and we are finding it now wherever the invasive host plant is found. Mile-a-Minute Weevil on Mile-a-Minute found during the Arlington BioBlitz. The mycology team of fungi hunters had a very successful search, finding more than twice as many mushroom species as the previous year, likely due to all the wet weather leading up the BioBlitz. They tallied 66 species. This along with last year's results will be used by them as the baseline for a "Fungi of Arlington/Alexandria" project they've been working on. For an interesting look at how they conducted their search, please check out this short video: https://www.youtube.com/watch?v=rLrn51pBzus. A Beefsteak Mushroom, oozing in its classic way that helps identify it. The strange looking Dog-nose Asphalt Fungi, another Arlington first. All in all, a fun and hands-on way to collect a survey of the natural world. While it's only a snap shot in time, by doing enough of these snapshots using the observations of citizen scientists, we get a better picture of the natural world for that location. This is just one method of getting biotic inventory to get a better idea of what animals and plants live in Arlington. Knowing what we have of course is necessary for us to better manage what we have left of the natural world, as well allowing us to compare if what we're doing is working. This is all leading up to the next update of Arlington's Natural Resources Management Plan which will hopefully take place over the next year or more. If you'd like to contribute observations, please try the iNaturalist app at https://www.inaturalist.org/ and if you'd like to see more results for the Arlington Bioblitz, search under Projects for the 2018 Arlington County BioBlitz. The BioBlitz Mycology (Fungi) team discusses a discovery.